Although centipedes and millipedes are not actually insects, they are related. They have evolved from common ancestors that were the first creatures to make the move from water to land hundreds of millions of years ago. The most obvious difference is the number of legs – all insects have three pairs; myriapods can have dozens or hundreds of pairs. Myriapods have elongated bodies that are cylindrical or slightly flattened and consist of many segments. Each segment holds one or two pairs of legs. The head holds mandibulate (chewing) mouthparts, a pair of antennae and a pair of simple eyes, although some species have no eyes. Many species have glands that excrete a foul-smelling liquid to deter predators. 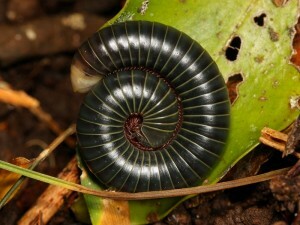 A rainforest millipede from Queensland. The young hatch from eggs and appear similar to an adult, but sometimes they have fewer body segments and fewer legs. They moult several times as they develop and it is during these stages that the extra legs and segments ar added on. Females sometimes protect the eggs during incubation and occasionally stay to protect their young for a short time after hatching. Centipedes are predators and will prey on almost any invertebrate, including other centipedes. Some of the larger species have been known to take small frogs and lizards. They possess a pair of fearsome fangs, through which they inject venom to subdue their prey. They then use their mandibles to cut through the out shell or skin to get to the soft tissue inside. Millipedes are herbivores and scavengers and mainly survive on rotting vegetable or animal matter. Myriapods can be found over much of Australia. Millipedes are more common in areas with a milder climate and plenty of moisture. 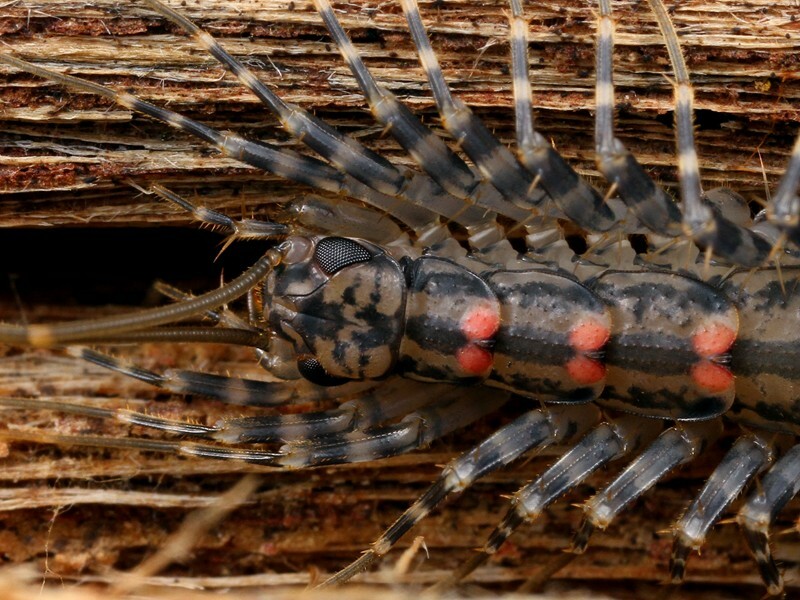 Centipedes are also common in these areas, but some species have made a home in our more arid regions. 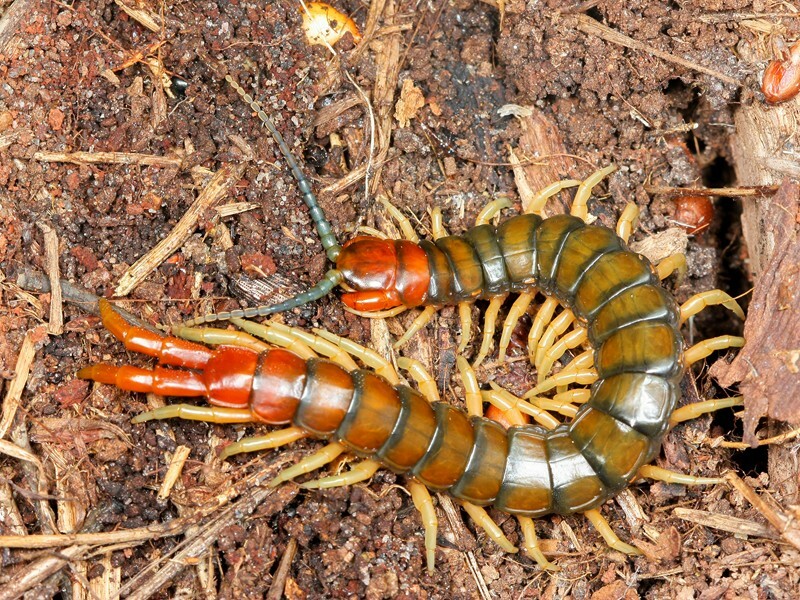 Allothereua maculata, a fast-moving predatory centipede. Thanks to Dr Robert Mesibov from the Queen Victoria Museum and Art Gallery, and School of Zoology, University of Tasmania, for his kind assistance in identifying some of my millipede species. For more information on millipedes, visit Dr Mesibov’s Tasmanian Millipede site.